Bluetooth� compatible phones (hfp) and portable audio players (avp) can be registered simultaneously. You can register up to 5 bluetooth� devices. Display the "bluetooth* setup" screen. *: Bluetooth is a registered trademark of bluetooth sig, inc. 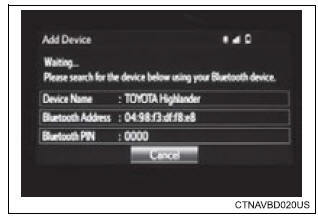 When this screen is displayed, search for the device name displayed on this screen on the screen of your bluetoothr device. For details about operating the bluetoothr device, see the manual that comes with it. To cancel the registration, select "cancel". Register the bluetoothr device using your bluetoothr device. A pin-code is not required for ssp (secure simple pairing) compatible bluetoothr devices. Depending on the type of bluetoothr device being connected, a message confirming registration may be displayed on the bluetoothr device's screen. 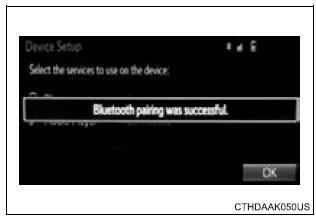 Respond and operate the bluetoothr device according to the confirmation message. Check that this screen is displayed when registration is complete. Select "ok" when the connection status changes from "connecting...?H to "connected". If an error message is displayed, follow the guidance on the screen to try again. Registration can be performed from screens other than the "bluetooth* setup" screen. Display the "bluetooth* audio" screen. Follow the steps in "how to register a bluetoothr device" from "step 2". A confirmation message will be displayed, select "yes" to delete the device.